Self Scout: Tough questions to ask of yourself, your coaching staff and your process before heading into next season. If you are reading this at or near the date of publication, my hope is that the following questions do not have to be answered for a few more weeks! If your season is over and the sting from coming up short of that state, conference or national championship is still fresh it is time for some self-scouting. Next season starts now. Basketball coaches have no problem with critiquing their players, their administrative support, their opponents or the officials. Can we critique ourselves or allow a peer to critique us and our performances with equal scrutiny? At this point in the calendar some introspection before next season and off-season workouts begin can be helpful. Three Pillars – Who Are We? Here is an exercise: think of the best high school programs and perennial powers in your state or in your collegiate conference. Think of some of the traditional powers at the high major or NBA level. Think of some traditional powers in other sports such as NCAAF, NFL or MLB. There is something they have in common. They know who they are and they have intentionally cultivated this identity. The players may come and go. Some go on to play at the next level while others simply graduate and move on. In the professional ranks, players may retire, leave via free agency or trades. But in all of them, no matter the level of play, there is still a certain “sameness” to the way they play. Year after year, despite the departure of experienced players, not only do they win, but they do it in a similar fashion. What are we “known” for? What is most identifiable about the way we play? In a perfect world, how would we like to play? An exercise we do with head coaches is the “Three Pillars” session. In this session we brainstorm some things with coaches about style of play, then whittle them down to three (no more, no less) pillars of play for their programs. These three pillars then become the guiding light for their programs. These are not “back of the T-shirt” intangibles such as “Heart, Hustle and Togetherness.” Those are admirable qualities and every coach wants his/her teams to display them. Rather, these are tactical decisions that we can begin planning workouts around. They drive every decision in practice planning, drill selection and scrimmage situations. Those three items help a coach plan every practice. They tell him/her what emphasize and prioritize on a daily basis. Everything we do in practice ties into these Three Pillars. These are an example of one coach’s Three Pillars. Yours may be very different as you want your team to play a style that may differ from the pillars above. These three are not “right” or superior to any other three. You do not have to select these three, but select three. How do we want to win? How are we willing to lose? Am I comfortable and are we as a staff comfortable with the trade-offs inherent in the decisions we make about our identity? What do we devote more time to, enhancing our strengths or addressing our weaknesses? Do our practice plans and everything in them address these pillars? If we were being scouted by an opposing coach, would he/she easily pick out these three items as our strengths? If my grandmother watched us play could she pick out these three items as our strengths? The first step towards having an identity on par with the premiere programs you compete against is uncompromising commitment to your Three Pillars. Perhaps the most influential innovation in the basketball world of late is the proliferation of analytics. 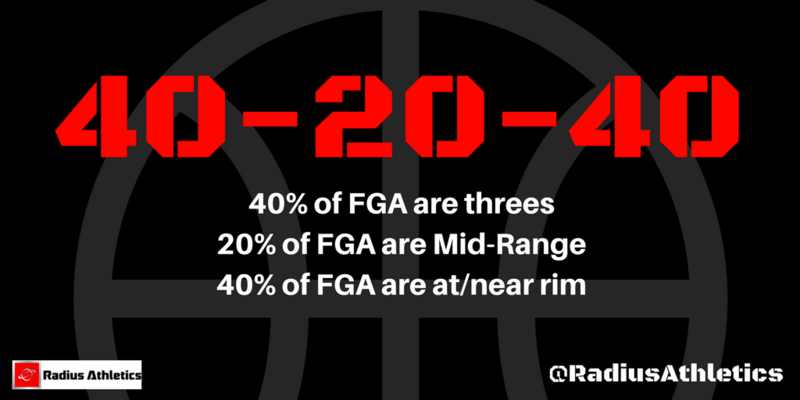 Statistics can reveal some areas in need of emphasis in the off-season. Scout your numbers and see what they reveal about your team. Begin to look at the game through a “per possession” lens and ask yourself how can we win more possessions? Basic analytics can shed light upon shot allocation, efficiency as well as the performance of opponents. Abundant information can be derived by looking back at your season statistics. Some of these measures may require you make a commitment to tracking new things for next season. What were our opponents’ PPP? What line up combination had the best PPP? The worst? What players had the best PPP? The worst? What does our shot chart look like? How close are we to 40-20-40 (see graphic above)? What value are we getting per shot from our three-point, two-point and free throw attempts? What percentage of our total points come from three pointers, two pointers and free throws? Or opponents? Do the shots generated by our offensive approach square with what analytics tell us? Are we willing to let numbers influence playing time decisions? Can we dedicate a staff member to a deeper study of the numbers? What do our Four Factors numbers look like? Our opponents? Are biases influencing our decisions? What are we emphasizing that may run counter to the analytics approach? How do we use analytics to help better inform and teach our players skills, system and tactics? Turnovers are the undoing of many teams. You do not need the stat sheet to tell you that. They are the main detractor from PPP. Go back and look at every turnover and see if there are common themes. Are there repeated situations we can recreate in practice that would help decision making? Are our turnovers a function of position and vision? Strength? Balance? Footwork? Conversely, what can we do defensively to impact the position and vision of our opponent thus increasing their turnover rate? 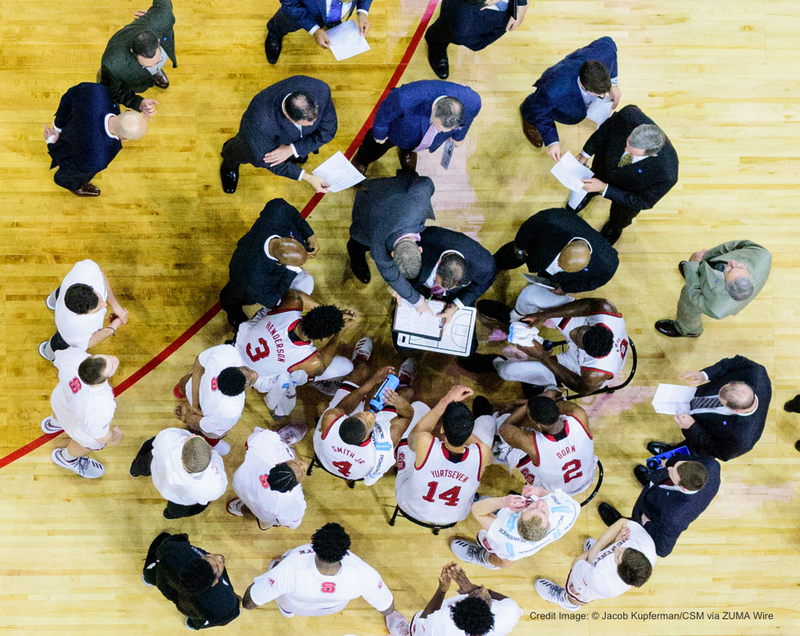 Coaches can fall at different points on the analytics spectrum. Some are naysayers who dismiss analytics while others shape an entire program around the numbers. But a possible way to find a competitive edge for next season is to more deeply explore the numbers and their impact on play. Become the editor of your program. Did you know that about two-thirds of the Best Picture Oscar winners have also won an Oscar for Film Editing? A masterpiece does not become a masterpiece because of what you put in. It becomes a masterpiece because of what you leave out. Often coaches seek something else, a new offense or an additional defense, during the off-season believing that if they just add these new wrinkles all of their team’s trouble will vanish. With the advent of social media, YouTube and blogs (like this one) coaches are bombarded with X’s & O’s and drills and it’s easy to be distracted by the things we see other coaches doing. But most of it is just “stuff” and the fallacy of “if a little is good then more must be better” is a pathway to mediocrity. Coaches must come to terms with the idea of trade-offs. When you add, you must subtract. Practice time is the finite resource and adding another set play, continuity offense or quick hitter comes at the expense of something. When you rehearse those routines in practice you are making the choice with that time that comes at the opportunity cost of the myriad of other things you could be working on. Too many coaches fall into the “we can have it all and be good at everything” trap. As a result they bog down in plays and easy-to-install patterns that do not truly advance the basketball know-how of their players. Does what we are thinking of adding advance our players understanding of the game? Or is it just another “play” or “offense” in the traditional sense? 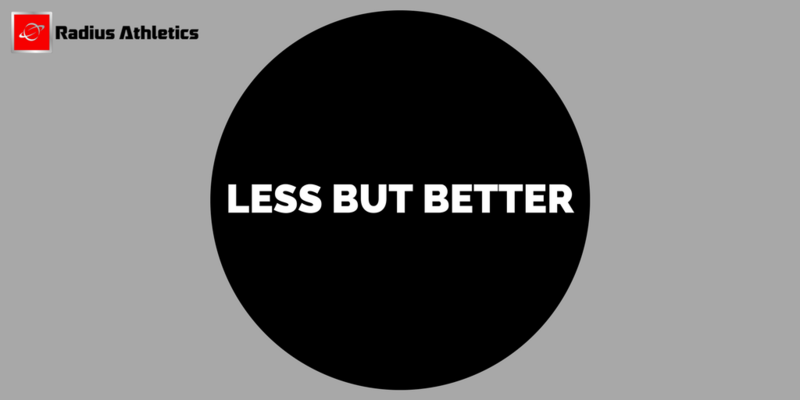 Are we adding something better or something else? If we add this, what are we taking out? What can we delete from our practice plans and drill library that does not fit with our pillars? What are our “clown drills” that we are wasting time on that have no correlation to in-game performance? Can what we are contemplating adding be taken away by opponents via scouting? Leave out the clutter and simplify. Groupthink leads coaches to believe that the better coach has the thicker playbook. Some are impressed by complexity but all are dazzled by well-executed simplicity. The Blackberry has buttons and gadgets all over it, the iPhone has one button. Which one are people sleeping on sidewalks outside of retail stores to get their hands on the moment it becomes available? It is not too soon to begin addressing needed change. Begin formulating a plan for the evolution of your program. Gather your staff and talk through each questions in the bullet points above. Have a “Deletion Party” where you gather your staff and clean out the playbook and drill library of “stuff” and clutter-causing clown drills. Make a move to a more conceptual style of play that advances basketball skill and decision making. Visit the practices of some coaches you admire and observe, take notes and ask questions. Find a unbiased and objective mentor to bounce ideas off of and seek unfiltered feedback from. Study and read up on the ideas you think it is time to implement. Investigate many things, but invest in and commit to few. Whether your team met all of their goals or fell short, do not remain idle this off-season and expect improvements to come. 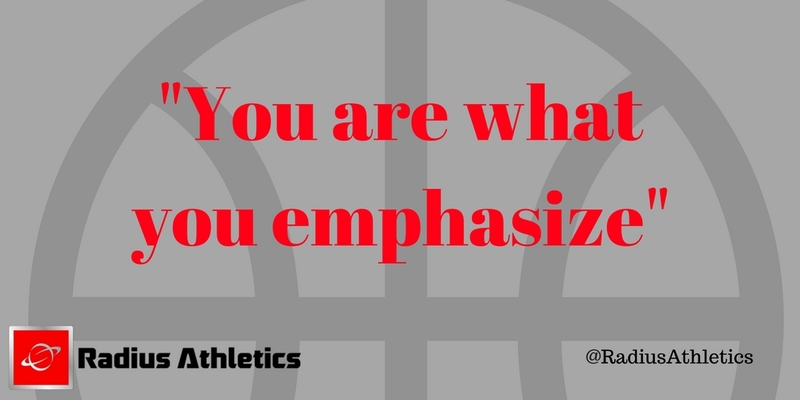 Be intentional, introspective and thorough in your evaluation of yourself, your staff and the state of your program. For help with practice planning and implementation of a conceptual-based offensive attack featuring the above concepts for finding, using and creating offensive advantages please reach out! Any questions: Contact me. Happy to talk hoops any time day or night! Sign up here for our twice-monthly newsletter on conceptual basketball concepts.